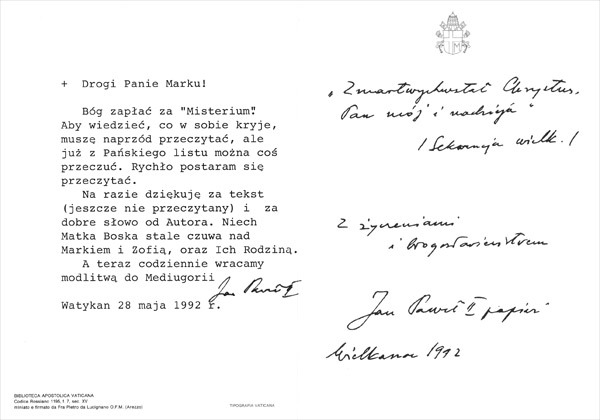 In October 2005, letters between Marek and Zofia Skwarnicki and the late Holy Father John Paul II were published in Marek’s recent book: John Paul II : Greetings and Blessings – Private Letters from the Pope, published in October 2005 by Bertelsman Media, Poland. + Dear Mr and Mrs! 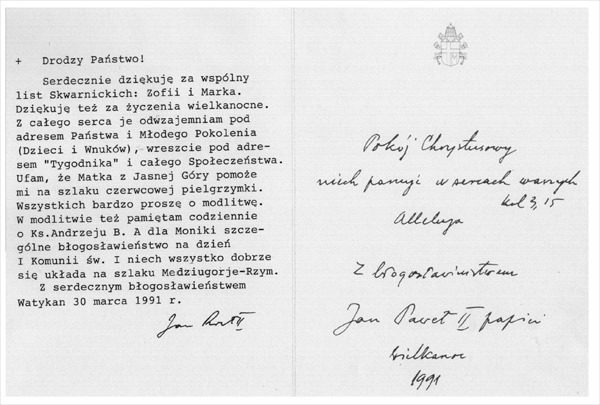 I cordially thank for the joint letter from the Skwarnickis: Zofia and Mark. I also thank for the Easter wishes. I return them with all my heart to you and the Young Generation (the Children and Grandchildren), and, eventually, to the Weekly and the whole Society. I trust that our Mother of Jasna Góra (the Bright Hill) will help me on the route of my pilgrimage in June. I do ask you for your prayer. I also remember in my everyday prayers about Father Andrew B. And I am sending a special blessing for Monica on the occasion of her First Holy Communion. And may everything work out fine on the Medjugorje to Rome journey. 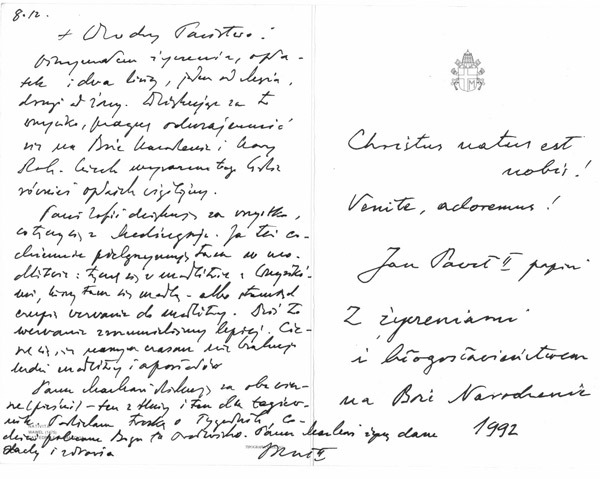 “I thank you very much for the both letters. 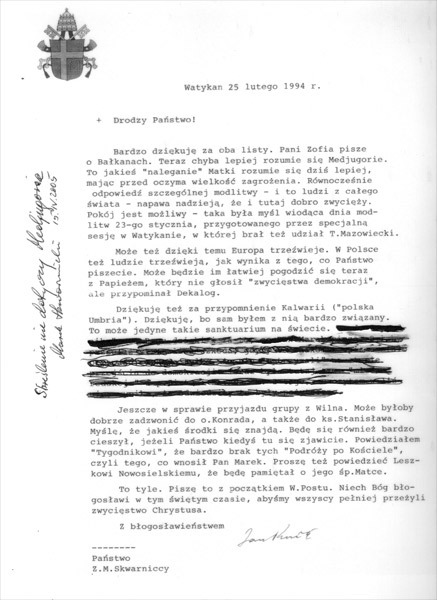 Mrs. Zofia is writing me about the Balkans. I guess Medjugorje is better understood these days. This kind of “urging” of our Mother is better understood today when we see with our very eyes the enormousness of the danger. At the same time, the response in the way of a special prayer – and that coming from people all around the world – fills us with hope that here, too, the good will prevail. Peace is possible – such was the motto of the day of prayers of January 23rd, prepared by a special session in Vatican in which Mr. T. Mazowiecki also participated.